Doveton College recognises the importance of the partnership between the College and parents to support children and young people’s learning, engagement and wellbeing. We share a commitment to, and a responsibility for, ensuring inclusive, safe and orderly environments for all children and young people. 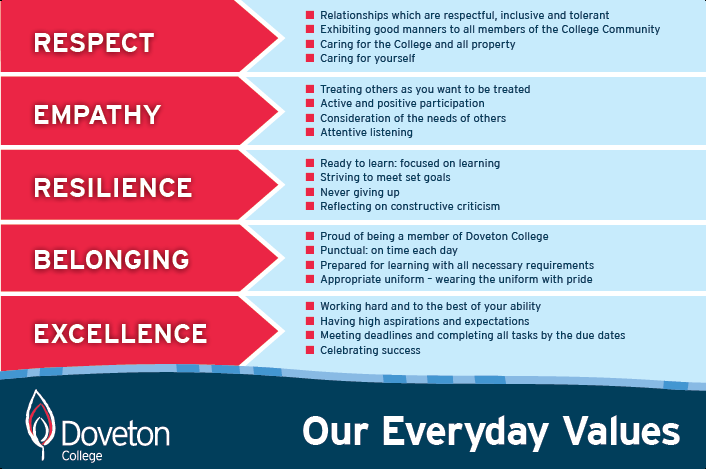 This Statement of Values sets out our behavioural expectations of all members in this school community, including the leadership team, all college staff, parents, children and young people, our agency partners and visitors. It respects the diversity of individuals in our college community and addresses the shared responsibilities of all members in building a safe and respectful community. Discrimination, sexual and other forms of harassment, bullying, violence, aggression and threatening behaviour are unacceptable and will not be tolerated in this college. Doveton College is a child safe organisation where children and young people are safe and feel safe. 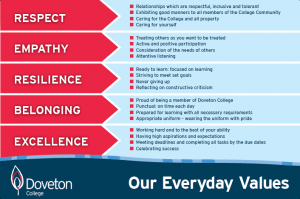 These values identified in the picture above are the basis for how our values are communicated and enacted within the College. In every classroom, and all major office spaces, posters of our core values are displayed and refered to in the students everyday lessons. To view our Strategic Plan, Annual Implementation Plan or Policy overview, please go to the Reports and Policies page.